The effects of poverty are not just on the wallet, but in every barrier to health and wellbeing. 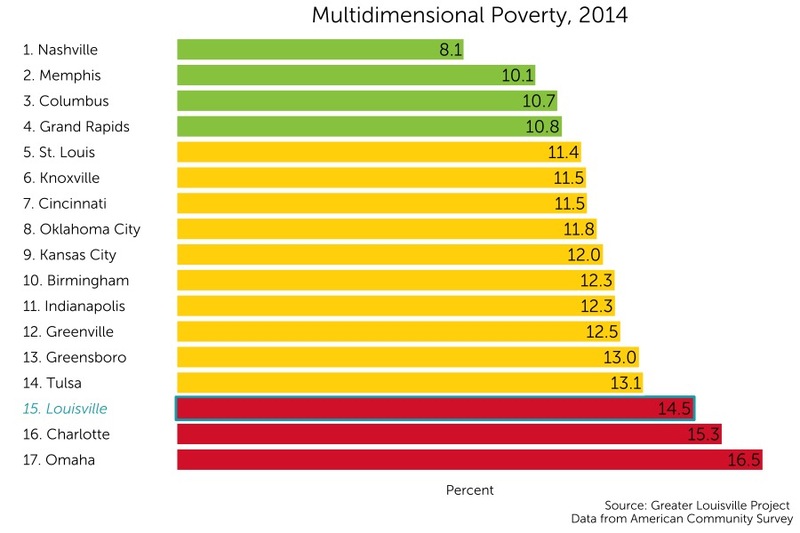 The multidimensional poverty index reflects the fact that individuals experience poverty in multiple forms: low income, poorer health, unemployment, low education, and living in a poor neighborhood. These factors are not additive–each experienced factor multiplies the barriers to success for an individual in poverty. In order to address the complex issue of poverty, efforts to effect positive change must be coherent with the notion that poverty is caused by multiple, confounding factors. Louisville currently ranks 15th among its peers in rates of multidimensional poverty with 14.5% of residents living in multidimensional poverty. The multidimensional poverty index evaluates poverty through four dimensions: low income (150% of the poverty line), unemployment, lack of health insurance, and lack of a high school degree. A neighborhood is determined to be in multidimensional poverty if its average z-score across all four factors is greater than 1. On this metric, Louisville ranks among the bottom tier of its peers according to a natural breaks algorithm. Cities in green are those that outperform their peers, cities in yellow represent the middle cluster, and those in red are a group that lags behind its peers on this indicator. Where is multidimensional poverty concentrated? Levels of multidimensional poverty vary greatly across the city. The neighborhoods with the highest level of multidimensional poverty are Russell and Portland. One of the tracts in the Portland neighborhood also has a very high level of multidimensional poverty, though it is offset by other tracts with lower levels of multidimensional poverty. The neighborhoods with the least multidimensional poverty are Floyd’s Fork, Northeast Jefferson, and the Highlands.